Windows Memory Diagnostics Tool can be found by typing the word "memory" or "MdSched.exe" in the Start Menu search field. Also, the mdsched.exe file can be found in the C:\Windows\System32 folder. In Windows 10 this tool is called "Windows Memory Diagnostic". When the program starts you have two options: Restart now and check for problems or Check for problems the next time I start my computer. Choose the option you prefer. When the computer is restarted the Windows Memory Diagnostics Tool starts automatically. While the tool runs, you will see a progress bar indicating the status of the test. Windows Memory Diagnostics Tool offers some configuration options. To access them, press F1 and the following screen will be loaded. Test mix - Choose what type of test you want to run: basic, standard or extended. Cache - Choose the cache setting you want for each test. Pass count - Type the number of times you want to repeat the tests. To apply the selected configuration options, press the F10 key and Windows Memory Diagnostics Tool will make the memory test according to your options. Once the test is done, Windows Vista will restart automatically. If the Memory Diagnostics Tool does not find any errors, you'll get a message that no errors were found. If the Memory Diagnostics Tool detects problems with your computer's memory, contact your computer or memory manufacturer for information about fixing the problem. Knowing exactly what Vista's Memory Diagnostics Tool found would be extremely useful, especially if I have to contact somebody to fix it. Telling them, "Gee, I don't know what the problem is, but Vista's Memory Diagnostics Tool said I should call you to fix it" puts a strain on my credibility. It's simple, either it is working 100% or the memory is faulty. As simple as that, there cannot be 98% working memory since DIMM modules(actual RAM) is addressed RANDOMLY, so you don't need to know any more specific information. So even when you have single bit of a RAM module faulty, you need to replace your RAM. I used the memory diagnostics tool and now every time I turn on my computer it shows up and runs again, I didn't get any results after the test and now there is a memory diagnostics tool tray icon showing on my taskbar. ??????? Somebody help please! Same thing for me, it runs in my taskbar all the time I can't turn it off I want it gone my memory is fine , did you get any info on this? Does anyone know how to find the results of this test? I ran it thinking that a message would popup when Vista rebooted as the instructions seem to suggest. No such message appeared. I do not know if it passed or failed. Knowing which address failed would make it possible to determine which memory SODIMM to replace in my laptop, if any. BTW - I did not get an icon in the Task Notification area nor does the test run every time I start my machine, as others have reported. I am on Vista SP1. I did the test, and watched the test as it went along while the test said "didn't find any problems yet". It said that all the way up until the computer rebooted.. so you would figure It didn't find anything, and you would get a report like it said when you log back on. Well, logging back on, the diagnostics tool is in the system tray, and you can try to click on it or whatever, but it doesn't open, it doesn't do anything. What the heck is this. No one has posted a response to this problem. Did anyone figure anything out???! I also couldn't find the Memory Diagnostics Tool results in the system tray, but I did find them in the system logs. From there you can browse for the results or use "Find..." to search for "Memory". 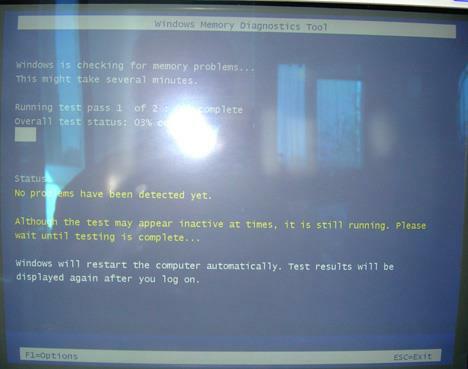 >"The Windows Memory Diagnostics Tool tested the computer's memory and detected no errors"
Running MDRes.Exe in System32 causes a message with the basic result (pass/fail) to appear briefly in the Notification Area but for the details the suggested search of the system log seems to be the answer. does anyone knows how to trun off the memory program? I ran the windows memory diagnostics tool program but did NOT get any feedback. now the program is still running on my task bar. does anyone knows how to trun off the memory program?????? Maybe you can help me... After runnig a MDT on extended settings with two passes, progress stops on 10% and won't go (waited 3 hours), but test doesn't freezes (I can exit or change settings). I have 4 GB OCZ DDR-3 with raised voltage to 1.84 V.
mine does the same thing at 10 percent i have 8 gigs ocz sli ready ram. I have 3x2GB (6GB) of OCZ gold RAM (and have been having really bad stability issues with Windows 7). I ran the extended test and it too hangs at 10% but after a couple of hours it continued and then stuck again at 80% and at 90% but did complete. I have read that WMT only checks the first 4GB RAM, so I removed 1 bank and ran the tests again. My extended test failed twice in a row, so I'll be looking to contact overclockers agin. 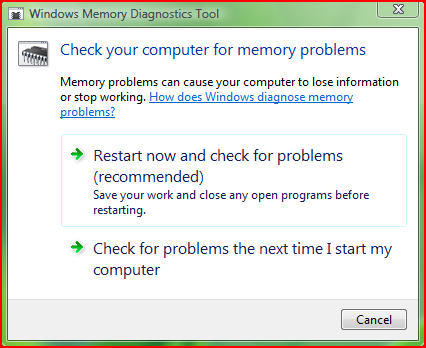 during memory diagnostic tool, vista shut down after 50% 1st time, 2nd time 38% and 3rd time after 30% of diagnostic. Reason for doing diagnostic is my vista when started it displays "Muicrosoft ONECARE STOPPED WORKING then it locks all the program. Not be able to start any other program, including system restore and it just locks everything. then done sytem restore from safe mode, now window goes blank after windows logo then "WELCOME", only thing I can do is CTRL+ALT+DEL to show task manager nothing else. everytime i turn my computer on it does the test and runs on continuously SOMEBODY HELP PLEASE! The moral is, because a web site says do something does not mean it's a good idea. Check lots of sites first and always read what others have said before you do a thing. 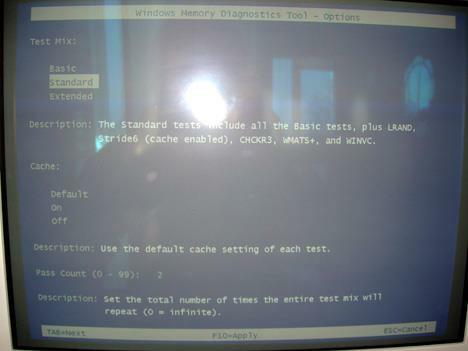 I followed the instructions to run the Windows Memory Diagnostic tool on my HP desktop at next startup. I have done the next startup, and the monitor is black. No screen ever came up, and my computer is totally unresponsive after an hour. Ctrl+Alt+Del does nothing either. I ran the test because over the last several months my computer has become painfully slow. Most of the time it seems that it has something better to do and ignores me, greying out the application I am trying to work on and ignoring me for minutes at a time in favor of whatever it wants to do. Something must be wrong, but it has never done anything like this. help? Would doing a restore point reload fix my memory problems? the system is going on testing. i want to know what happen laptop . it is due ram flaut.or cpu fan speed. I ran the diagnostic and now my computer will not go to the log in screen... goes through booting screen okay... is there a fix? and does this mean that the data on the hard drive is gone? First of all it took over 17 hours to run MDSCHED on my PC. I used the "extended" test setting and have 16GB of RAM. Be patient with this tool as long as you don't see any error messages. 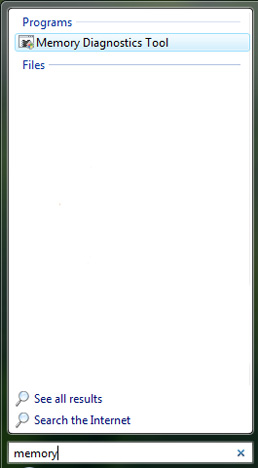 I had a blank / black screen after reboot. Windows would start but I had no video. The boot was different in that the bios options (for entering bios setup) were never displayed. I have an EVGA 920 SC video card. It costs over $200 so I was worried. First I noticed it would boot ok in safe mode and my video drivers looked fine. I unplugged it and took out the video card to see how it would boot with onboard graphics (not using video card). I realized this is my PC that does not have onboard graphics! I put the video card back in, plugged PC back in, and everything was fine. I think it was the unplugging the PC for a while that actually fixed it. I'm suspecting something early in the boot process gets corrupted and remains corrupted until power is completely removed. I had my PC unplugged for several minutes. It may only require 10 seconds but give it a good time to sit and drain all components.